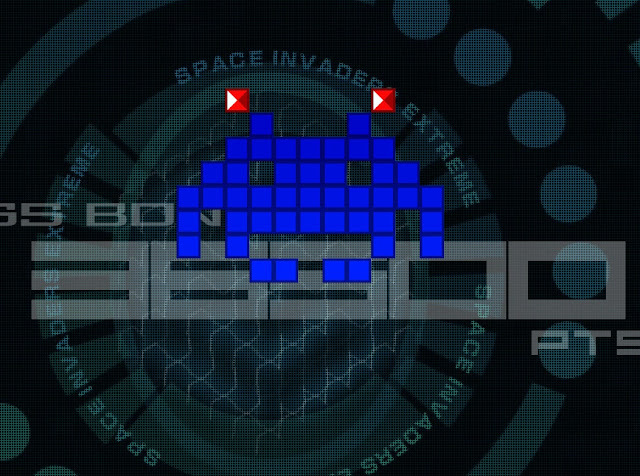 Space Invaders Extreme is a masterpiece of modern arcade gameplay. Originally released ten years ago on the DS and PSP to mark the 30th anniversary of the greatest arcade game of all time (and yes, I genuinely believe Space Invaders is as good as it gets), it has now been released on PC to celebrate the 40th anniversary of the venerable, legendary game. 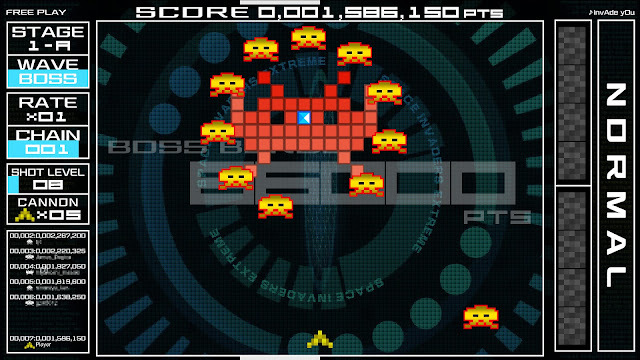 Space Invaders is, at core, a rhythmical action game. Even the original, which had a soundtrack of just four notes, paired that music to the rhythm and movement of the alien invaders that you needed to shoot. As you shot more, those enemies sped up, and so too did the music. That combination of music and movement made the original Space Invaders a dance, and weaving your defending space ship in and out of the enemy fire while sniping those enemies down becomes hypnotic. Get good at Space Invaders and you almost enter a trance where you clear the mind and allow your raw reactions to take over. 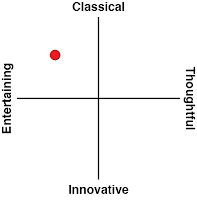 It's very zen, and probably the reason that I find myself spending so much time playing it on my arcade table at home; it's one of the few things I can do to truly tune out of everything and just relax. Space Invaders Extreme takes that rhythmic action to an entirely different dimension. 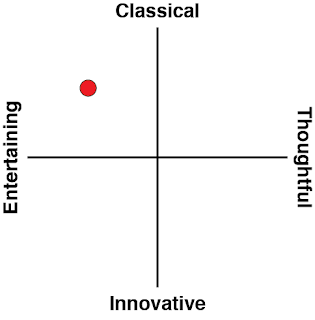 With this game players get a visceral and vibrant explosion of pulsating colour and noise. It's hard to remember the specific music that you hear while playing Space Invaders Extreme, because you're so drawn into the action, movement and energy of it all, but you certainly feel it, and while it's a soundtrack that isn't paired specifically to the movement of the aliens this time, the snappy pace of it perfectly matches the frenetic action to the point where it still feels very rhythmical and dancelike. With Space Invaders Extreme, gone are the repetition of the same block of enemies with each new level. This time around enemies arrive in patterns, and while they continue to move in the same way (from one side of the screen to the other, and each time they reach the edge they "drop" a little closer to the ground), now they also have special abilities, meaning you need to take different approaches to them. Some enemies have shields. Some are hard to hit because they're so tiny. Some are huge and take many hits to defeat. Thankfully for you, if you shoot four of the same colour, they'll drop a powerup, which can make defeating them remarkably easy. My favourite is a laser powerup which slices through them like a hot knife through butter. It's possible to clear an entire playfield with a single attack from this thing, and the resulting explosion of colour just feels so good. Then come the boss battles. Each boss is made up of a huge number of blocks (a clever way to call back to the pixel designs of the original), with one particular weak spot. You need to clear away the other blocks in the way - usually while dodging all kinds of incoming fire and enemies - to the point that you're able to hit that weak spot block. And you need to be fast about it, because those protective blocks do reappear. These boss battles can be tough and require some incredible twitch responses, but even as you sweat over them, hoping to pull off a desperate victory with only one ship left, it's certainly an exciting experience. The game's broken up into a number of levels, which branch, depending on difficulty, with higher difficulty "branches" requiring better performance on your part. Each level is further broken up into a number of waves, each structured very differently, with a boss battle at the end of it. Giving the game yet more variety is the occasional rainbow coloured UFO that appears at the top of the screen when you shoot sequences of four coloured aliens one after another. Shoot it and you get taken to a bonus level that will require you to take down a certain number of enemies in a few seconds. Do that and you'll be taken back to the "main" game, but in "fever" mode, which is code for "an opportunity to give your points score a massive boost." All this work is, of course, for glory on the leaderboard. As befits a game that is all about energy, speed, and rhythm, you'll also be seeing your score at the top of the screen racing through to the millions, with almost everything you do generating points in one way or another. 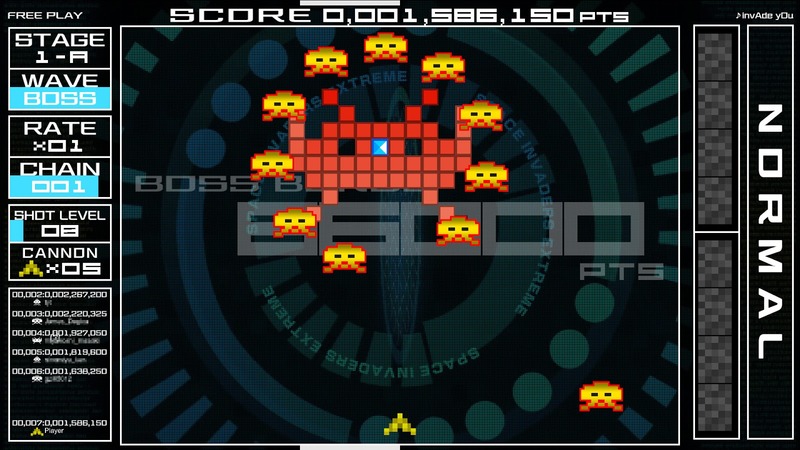 You won't have time to really consider how to maximise your scores while playing Space Invaders Extreme. Rather, the techniques and top score bonuses will become intuitive. A new pattern of enemies appears on screen and intuition will kick in, and you'll go about targetting the jackpot scores. Because this is learned through rote and experience, your chances of walking away with a really good score in your first couple of runs of Space Invaders Extreme are next to nothing. Even the first first level, you'll surprise yourself in getting a "D" or "C" grade, and wonder what you could have done better. Then you'll try again and get a "B" and then an "A", and you'll come to realise that experience alone will see exponential improvements to your leaderboard score. It's quite satisfying to know there's always so much room for improvement, and seeing your score improve exponentially improve from one attempt to the next. There's a ceiling to be sure, but compared to the original Space Invaders, where I've been stuck on the one top score for six months now, the points flood of Extreme is positively inspiring. 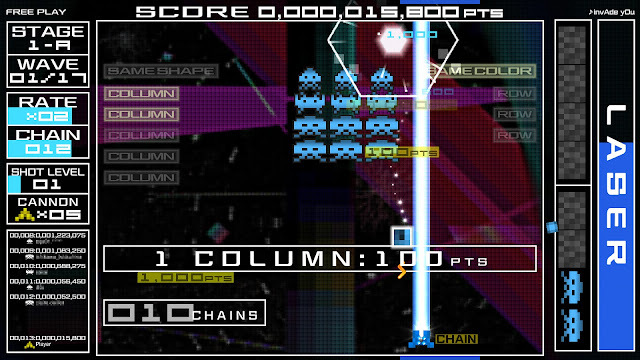 The best thing about Space Invaders Extreme, though, is that for all the modernisation, the game has kept the classical core that made people fans of Space Invaders in the first place. The enemies have kept the same design, and the developer has worked with those rather than try and introduce new stuff. There's a great deal more colour and energy in the game, but the basic principles of Space Invaders being a rhythmical action game have remained true. Nothing about Space Invaders Extreme is fundamentally different to how it was in Space Invaders, but it is the greatest arcade game packaged up in a way that the modern audience will find it palatable. Hopefully people are still playing this 40 years down the track, as I am still playing the original, because it deserves to be. It's just that good.